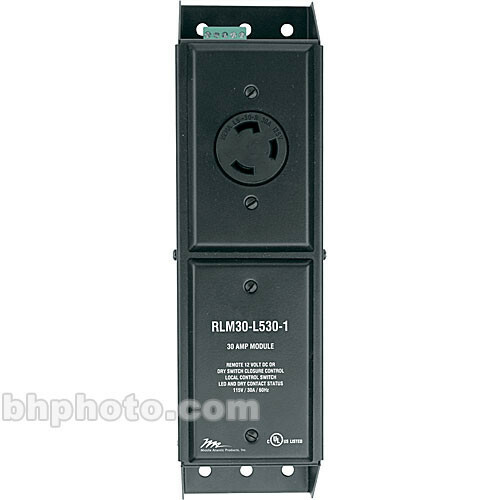 The Middle Atlantic RLM30-L530-1 30A Stand-Alone Power Module with NEMA L530 Plug provides switchable power distribution for components requiring 30A of power. The RLM30-L530-1 can be controlled locally or remotely by using the Middle Atlantic USC-6R universal sequencing controller or any controller that sends 12 volt DC or contact closure outputs. Comes with a NEMA L530 20 Amp twist lock plug, letting you draw the full 30A of power. Box Dimensions (LxWxH) 25.0 x 8.0 x 5.0"